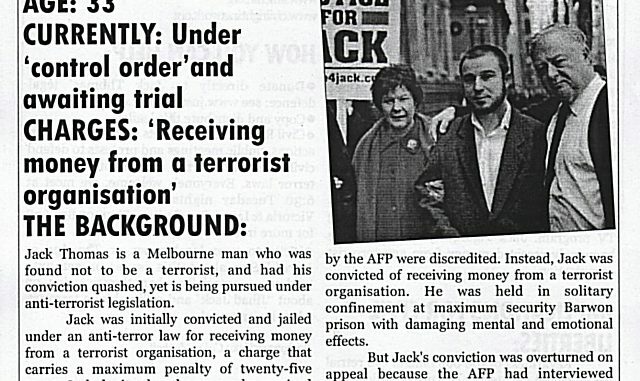 JACK THOMAS, a 31 year old Melbourne father, has become the latest victim of the Howard government’s draconian terror laws. Thomas has been charged with receiving financial support from al-Qaida, providing al-Qaida with resources or support to help them carry out a terrorist act and having a false passport. He has been denied bail despite having a job and a family in Werribee, in Melbourne’s outer south-western suburbs. The evidence against him largely depends on interrogations carried out by Pakistani security agents using torture techniques. His lawyer, Rob Stary, told the ABC: “He had been interviewed by a number of intelligence services, not just Australian intelligence services but Pakistani, American, perhaps others, and by the time the final interview was conducted with him by the Australian Federal Police, it’s fair to say the whole process was tainted in my view. “We’d previously expressed our disquiet as to the way he was detained. There are suggestions, for instance, that he was manacled during his detention, possibly hooded and in a way that might not meet the United Nations protocols on the detention of political prisoners. Thomas, a convert to Islam, went to Afghanistan in 2001 but left before the September 11 attacks in the US. He was arrested in Pakistan while trying to get home to Australia. The Pakistani military dictatorship held him for months before releasing him for lack of evidence. As with the case of David Hicks and Mamdouh Habib, the two Australians held and tortured in Guantanamo Bay, the Australian government offered Thomas no help. Now it is picking up where Pakistan left off. Rob Stary addressed a meeting this month, organised by the Maritime Union, marking the 150th anniversary of the Eureka rebellion. He told the large crowd that Thomas had been trying to rebuild a normal life after the trauma of imprisonment in Pakistan. As a criminal lawyer, he was used to dealing with clients in trouble because of poverty or troubled lives. Increasingly, he was being asked to defend people who were in trouble with the law for being militants or holding views outside the mainstream. Stary was the lawyer for jailed union activist Craig Johnston. Activists in the peace movement are discussing launching a defence campaign for Thomas.